Entries tagged with “Stuart Dempster”. Merce Cunnigham’s impact on the dance world seems without question, but his legacy extends far beyond that with his championing of contemporary art and new music. The list of artists he collaborated with is staggering especially when you consider how many of them had such an impact themselves on their various fields: Robert Rauschenberg, John Cage, Frank Stella, Morton Feldman, Maryanne Amacher, Bruce Nauman, David Tudor, Pauline Oliveros, Jasper Johns, Toshi Ichiyangi and on and on. His continual promotion of new music,the subject of this set, even at critical cost to the company is frankly quite amazing. Doing research on modern dance for these posts, the really pedestrian music that most dance companies utilize, no matter how cutting edge their choreography may be, highlights just how forward thinking Cunningham was and how willing to place himself, his dances and his legacy at risk in support of this music. Being allied with John Cage was clearly a massive boon in keeping abrest of the current trends in modern music and his long tenure as music director ensured that the companies music stayed on the forefront of the cutting edge. The very judicious additions of new regular musicians and use of guest musicians and composers kept continuity and kept things fresh. Cage’s legacy as musical director is in keeping with the rest of his career: also exploring, always experimental always looking for new sounds and new ways to use materials. Tudor’s tenure as music director was so short that he really had no time to make much impact. The company seemed to stick with the current regular musicians and composers and in fact there are no pieces on this set from that period. The final music directory, from 1997 until the end of the Merce Cunningham Dance Company Legacy Tour in December 2011 is Takehisa Kosugi. Kosugi has of course been a member of the Company’s pit since the sixties and had composed, or improvised many a piece for the company in the intervening years. I’ve expressed numerous time in these posts my mixed reactions to his work here – enjoying his violin and live electronics at times, his vocal work pretty much not at all. However to consider his work as musical director is a different matter as it is hard to say how much influence was Cunninghams. Cunningham was certainly well connected in artist circles and I’m sure met people that he’d like to work with and passed on suggestions. Equally so is Kosugi connected in the musical world, especially in NYC and certainly brought in a lot of the new voices. There has has been a Music Committee (currently Christian Wolff, David Behrman, John King) for quite some time in the company and they certainly have had some influence as well. Regardless of whomever may be ultimately responsible it is undeniable that the 13 year period after Tudor’s passing seems to be musicaly the weakest; the least cutting edge. The use of musicians associated with (or sympathetic to) the downtown scene such as Jim O’Rourke, Ikue Mori, Marina Rosenfeld, George Lewis, Christian Marclay seems most likely to come from Kosugi who certainly has intersected with that crowd. The use of more avant pop musicians such Radiohead and Sigur Rós (for Split-Sides, 2003), seems like a move from Merce; perhaps responding to what his younger dancers were listening to. This set dedicates only one disc to the music between 1998 and 2009 and with the exception of Annea Lockwood all are from longtime collaborators with the company. This disc is also by far the least interesting in the set with only a repurposed Cage composition of much interest. The second disc covers Events, which feature improvised music and many of the aforementioned downtown musicians; more on Events in the disc ten section of this post. It is hard really to assess the final decade of the company based on what is here – the set is always misleadingly incomplete (the aforementioned Radiohead and Sigur Rós being a late example not included music). There was definitely a lot more revivals in the companies final decade, which I think is reasonable – the dances could be “lost” without this oral transmission. Kosugi and the rest of the pit clearly did an admirable job on recreating the old pieces, or at least playing recordings of them for these revivals. Cunningham continued to make new dances and innovate with the use of his DanceForms software but at an understandably diminished rate. Cunningham’s legacy is as I’ve said undeniable and even if its final years weren’t as strong as its earlier years, he was still not spinning his wheels. The final disc of pieces composed for the Company is a letdown. It begins well with a very nice, though short, extract from a late Cage number piece but its all downhill from there. Disappointing pieces from King and Behrman, form the core of the disc and the final piece, by Annea Lockwood is nice enough, but spineless. Lockwood’s piece though is the most forward looking of these concluding pieces in that they commissioned a new (ish) composer who is clearly more hungry for exposure. The Cage piece is from 1991, one of several of his older pieces that was put to use to accompany new dances. King and Berhman are of course company regulars (and music committee members) and shows Kosugi not straying too far from associates in his choice of whom to commission. As I’ll discuss in the disc ten section below, he does seem to bring in a lot more new musicians for the Events, so frankly this could be a lot worse. But it does seem to be out of touch with more interesting musical work occurring during the last decade of the company. This is the only truly great piece on this disc; Cunningham utilzing a late Cage number piece for one of his later dances. It’s interesting to contrast how well they are able to get the orchestra to perform, considering the open rebellion Cage recevied from orchestra’s early in his career. But now he’s a household name, the practices of the experimentalists are, while not really embraced, at least understood. One8 was written for Michael Bach, who invented his own bow and commissioned a number of rather virtuosic cello pieces from Cage. Besides the musical notation itself, perhaps the most informative part of the score, the key to its understanding, is the phrase “for Michael Bach.” I am reminded here of the composer Sylvano Bussotti’s 5 piano pieces for David Tudor: that the title was not so much a dedication as an instrumental designation. The same is true of Cage’s score, since Michael Bach is not just a cellist, but an inventor of playing techniques. The recording begins with skittery cello, sounding almost electronic. Then the darker sounds of the orchestra coming in, each instrument in long low lines. Often brooding, some real dense parts, lots of horns. The cello cutting through now and again. Dempster here as the featured cellist is really great, this excerpt is probably the best version I’ve heard of 108; wish this whole disc was this performance. Early laptop piece, has a sort of “digital live electronics” feel a first but becomes increasingly typical of Max/MSP music of the time – grain based synthesist, sequenced rhythms, moving around the stereo field. Later sampled, looped piano that becomes pretty spectral and then a terrible sequenced digital percussion bit. Digital ping ponging and ponderous piano at the end. Overall a pretty lame piece and one where the excerpt could have been a lot shorter. “The music reflects the six-decade time span from 1947 to 2007 by combining a piano part, with preparations similar to those used by Cage in his “Duchamp” piece, with 21st-century music software and sound-sensing technology. Piano, with swirling laptop initially. The piano from Wolff is really nice. The guitar comes in and is slide and harmonics; a bit silly. The piece has a sort of loping feel to it; like a Bill Frisell piece. Percussion from the prepared piano, gentle americana from the electric guitar and violin and a sort of brooding wash from the laptop. Solo piano part in the middle is nice, rather Wolff-ish in nature (beyond being played by him) but again with a touch of jazz – ragtime almost. I wanted to like this piece a lot more; while it has its moments it’s rather thin on the ground. Becomes kind of ping-pongy digitally toward the end. Kind of a popping electrical sound, repeated guitar string taps, the sound of rushing water, metal on strings and so on. It goes through many different “movements” each with a different feel, but gives the piece a lack of unity (perhaps evoking the title). Best bit has this almost flatulent electronics that fades in and out along with a sound like a far away bull roarer and dripping water. All of this evokes frogs, insects and other flora and fauna pond. Like a sylvan version of Rainforest made for one of those “meditation” tapes. Lots of good moments like this but I can’t help but feel that every time I hear a Lockwood piece that while she may have innovated the style there are those that, even in imitation, do it some much more interestingly. This is an enjoyable enough piece but, frankly it’s background music. Dancers need space in which to dance, to run on and off stage, to be able to generate the needed velocity for leaps and bounds; but space was not always a given in the early days of the Merce Cunningham Dance Company. On their first World Tour in 1964 they took whatever space was offered to them and in one such space realized they couldn’t perform any of their current repertoire. Looking back to the “happening” at Black Mountain College where simultaneous music, theater, dance etc was performed in a cafeteria the Events were born. In these events the dancers would perform parts of dances, or improvise within a limited area, or perform simultaneous solos and the like. In the first Events, John Cage’s Atlas Eclipticalis was the music performed, but in later Events the pit musicians would primarily improvise. Disc Ten of this is presents thirteen short extracts (and really short as these would usually be an hour and a half) from these improvisations. This disc is sadly ahistorical as it begins in 1993 when hundreds of Events had taken place (they’ve done more than 800 of these so far) and it would be interesting to have heard parts from across the entire history. But apart from that, this was a disc I was quite interested in, as the Company musicians were primarily composer/performers and they primarily played their’s and others compositions. The Events also seemed to be a proving ground of sort for musicians -new and younger musicians would play in these pieces in the pit and some might later become regulars or be commissioned to compose for the Company. Perhaps it is to display the wide variety of musicians who were asked to play for these Events that they cover the era past John Cage’s tenure as music director. The first of these is the only one with Tudor and is easily the best of them; I for one would have enjoyed hearing some events from the heyday of the live electronics pit. The disc of Events turns out to be the absolute worst disc of the set and its biggest disappointment. The downtown (and others) musicians they bring in are uniformly terrible here, performing horrific laptoppery, banal turntablism, uninspired and dated electronics, wanky guitar, overly muscular sax and so on and is just in general a complete and utter mess. Kosugi, who performs in the bulk of these, often displays his worst tendencies: terrible vocalisms, overuse of delay and so 0n but is often the best aspect of these performances. There are some exceptions, the first short one that is simply a Tudor/Kosugi duo and some of the latter pieces which are primarily old hands: Christian Wolff, David Berhman et al. But primarily they are unfocused, misdirected excess that really disappoint. It is a cliché that composers and musicians who primarily play composed works are poor improvisers but cliché’s often arise from the repetition of a truth (and it should be noted that improvisers that play composed works are also often equally lacking; a situation which we get to hear a lot of these days). But really it is the “professional” improvisors here that are really terrible; those members of the downtown and related scenes: Mori, Marclay, Lewis, Scanner and so on. The absolutely terrible nature of much of this music lends credence to the notion that Kosugi’s tenure as music director was the end of the long run of creative music that the company promoted and supported. The dances during the Events on the other hand, seem to be of considerable interest. 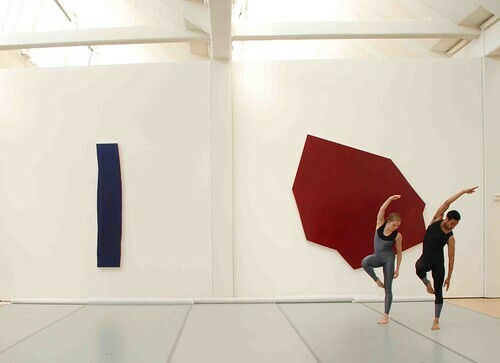 Especially as they are performed in galleries, sculpture parks and other unique locations. I’ve sprinkled the short descriptions of the Events recordings (I can’t really bear to listen to these enough to do more) with photos I’ve found on the web of various Events from the last decade. They don’t correspond to the music but they demonstrate some of the great settings and costumes used for these events. While this disc is a rather depressing way to go out, it doesn’t diminish at all to me the amazing legacy of music that Merce Cunnigham help facilitate nor the greatness of this set. Do I wish that some of the excerpts were longer and this disc to have simply not been part of the set? Yes. But then of course one would lose the historical record (no matter how incomplete) of what this music was like. Excerpts, or even better complete performances of all of the Events as digital downloads would be in my mind the best way to preserve this historical record without creating the vast amount of plastic that I suspect will be rarely played. In fact I hope that the MCDC moves in that direction to preserve the legacy – there is so much material and no amount of physical releases will ever represent it all. The MCDC has been very forward thinking with its use of online video, pictures and other materials, I hope that only increases in the future. After his death the Company members did a performance of Events in Central Park of which the above photo is one of many on Flickr. It was a believe without music and just the dancers, performing his choreography. A beautiful tribute. Rest in Peace Merce Cunningham, thanks for all the amazing work. And a big thanks to New World Records for putting out this amazing set. The only one of the Events in this set to include David Tudor – a super rare opportunity to hear him improvise. Thankfully Kosugi keeps his mouth shut and this is overall a great, if short, piece. Electronic drops, scrapes, stutters and echoed string plucks. Nicely spare, perhaps a pointer to how Tudor would have improvised into the modern era. Nice sputters and splatters of live electronics as Kosugi does short, soft attacks on the strings. Several good spaces at the end. Bubbly laptop, metallic rattly percussion (sort of Beins like) then washes and rushes from Kosugi. Big synth pads and weepy violin lines at the close. Rather cheesy overall. Steve Lacy. Soprano Saxophone. Need I say anymore? Begins with Lacy, melodic at first and then honking. Berhman comes in with cheesy pads, Kosugi with high lines. Moaning singing from Berhman, even worse then the Lacy. Overall terrible, so of course nearlry the longest of the Events excerpted here. Rather refreshingly noisy after the previous cheese. While rarely a fan of Marclay and O’Rourke this piece harkens to the energy, if not quite the quality of sounds, of the early Live Electronics. Bits of samples from the turntables, rushes of analog wash, digital bleeps and bloops; not stunning music but again good energy and above average for the disc. 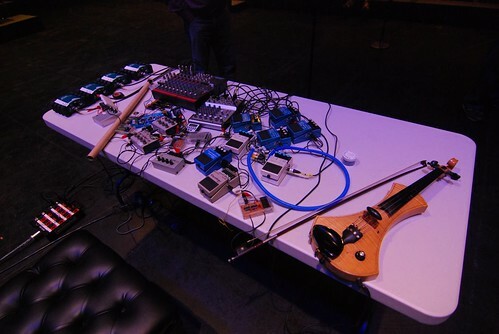 Sort of loping guitar, buzzing electronics and then Kosugi’s usual echo-laden live electronics and popping percussion. And particularly bad Kosugi voice performance – guttural syllabic and cut off. Horrid. Sort of hard to believe this is what they were doing in 2002, at this point the music for the MCDC, always so ahead of its time, sounds positively archaic. Almost ragtimish piano with more dominant (At first) electronic skittery sounds. It builds in intensity, both piano and electronics and then the piano drops out while the electronics continue apace. Real percussive oscillations from the electronics becoming a blurring wash. Moaning from Kosugi mixed in I think, but low threshold. This eventually fades away and its just short piano lines. Kosugi comes in with distorted vocal moaning/singing ruining an okay if not very special performance. 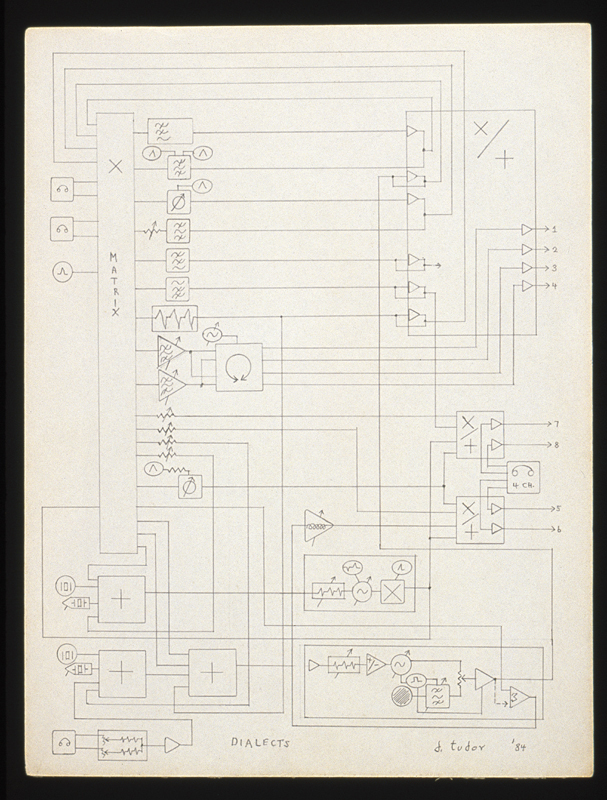 George Lewis electronics. meh. One of those pieces with bits and bloops coming everywhere – short percussive belts, long trombone moans and trumpet like wails. Shimmery laptoppery and so on. Pretty lame. Shimmery laptoppery from Ikue Mori which is typically meh but the excerpt includes some nice percussive, wandering piano lines from Wolff. Electronics become increasingly sequenced percussion which is pretty terrible. Wolff then jazzes it up a bit and frankly the whole thing falls into self parody. Alas. King and Lewis – not my favorite combo, but this is particularly terrible with distant rocking out guitar and electronic percussion and looped voices. Atrocious. Drum machines are horrific here- bouncy and popping sort of like an academic attempt at techno that totally fails. This along with a sort of bludgeoning drone and higher tone digital cheese. Lame. I think Scanner is pretty much of his time and place but I’ve definitely heard a lot better from him. More bad rhythmic laptoppery and rather crap disjointed playing from Jones and aimless piano work. Also some truly banal percussive bits – just shaking things for a bit and then a bunch of rather recognizable near quotations on the piano. Jones becomes a bit more showy with his staccato playing oscillating back and forth. For the longest of the Events, pretty uninteresting and rather rubbish. Oscillating tone to begin, then a space, then sort of tuning up back ground sound and dot matrix printery sounds. Nothing super special but pretty listenable and for the Events – not bad. Lots of sound of movement. Melodica sort of distant then various squealing sounds. Got kind of percussive and drum circle-esque. A bit spineless, but not terrible. John Cage died in 1992 and David Tudor in 1994. Cage was of course the music director of the Cunningham Company for forty years and a prolific composer of which many of his works were created or repurposed for specific dances, 80 of them according to the liner notes(1). This set features 9 pieces by Cage which I think demonstrates pretty clearly how incomplete it really is for covering the music used by the dance company. Of course it also demonstrates how much of Cages music, so derided for so long, is now available on recordings as they tended to avoid available pieces. Appropriately enough the set includes more pieces composed by John Cage than any other composers, though at 9 pieces it is far from the 80 he composed for the company. 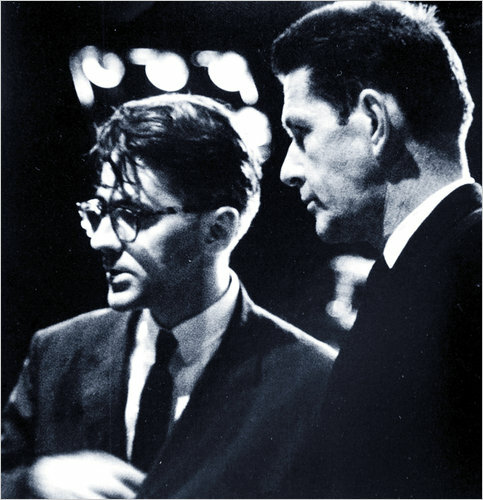 David Tudor had been the primary performer in the company from its beginnings in 1952 and took over as music director after John Cage. His tenure was short as in 1996 he suffered a series of strokes shortly followed his death, after which Takehisa Kosugi took over as music director until Merce Cunninghams death in 2009. Tudor of course also being a composer/performer of live electronics and created many pieces, the second most for the company. Likewise he is next most represented in this set with 7 pieces, but if you include him as performer he is involved in probably 75% of the music. This two disc set covers pieces composed between 1989 and 1997 during which time both Cage and Tudor passed away. Cage had primarily been working on his number pieces during the last years of his life, many of which were used as the accompaniment for Cunninghams dances. This set contains two of them as well as Sculpture Musicalis which while not a time bracket piece is a prime example of the instruction based pieces he was also doing during this time. Cunningham would continue to use Cage’s music after his death which considering how much Cage composed and Cunningham having disconnected music and dance is not surprising. Tudor’s compositions were inimically tied with his electronics setup and his own virtuosity as a performer and after his death at least some of the pieces would be played back from recordings as opposed to performed live. While he did some work outside of the company it was usually also in collaboration with other artists so none of his pieces were used for dances after his final pieces he made specifically for the company. 2008 Performance of Merce Cunningham’s Ocean in a quarry. Ocean, a piece that Cage was working on when he died that was completed (or at least realized) by Andrew Culver, which also had an electronic part composed by Tudor and is as far as I know not available is strangely absent from the set. A multimedia extravaganza along with the dance, perhaps it is forthcoming in a video format that would better serve it (this short documentary on YouTube about a staging of Ocean is worth checking out). Tudor’s composition required that “Each performer uses different sound materials, derived from peripheral “ocean” sources: sea mammals, Arctic ice, fish, telemetry and sonar, ship noises.”(9) which were then electronically and electro-acoustically altered. He only worked on one other piece after this, which was a multimedia collaboration with Sophia Ogielska presenting his working process utilizing his earlier piece Toneburst. So this would be about the final Cage and Tudor piece which it seems like it’d be a fitting piece for this overview but for whatever reason is absent. In my initial overview of this set I described the bulk of the discs as mixed, with perhaps three of the discs being pretty solid in and of themselves (1, 2 and 5). Disc seven is a fairly good example of this in that four of its five tracks are quite good (great even) but the initial Kosugi track, at over 20 minutes being one of the more unbearable of the set. However the final two Tudor compositions in the set and two of the last four Cage pieces in the set make for an overall rewarding disc once you skip that initial track. “One pleasure inherent in the dances of Merce Cunningham is the way they allow the viewer to enter and roam within them. 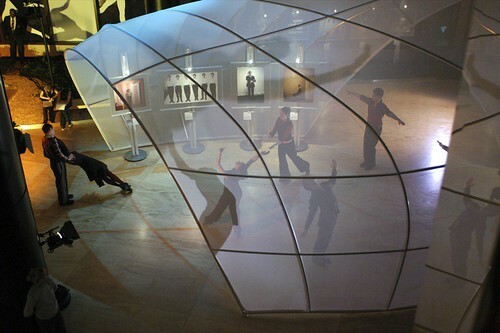 The specifics are clear in “Cargo X,” a 1989 piece set to music by Takehisa Kosugi and performed by the Merce Cunningham Dance Company on Thursday night. The set, designed by Dove Bradshaw, consists of a high ladder and sprigs of rather overblown and brightly colored flowers. There are seven performers. They are dressed in unitards whose colors are as intense as those that drench the backdrop behind them. And Mr. Cunningham has given the dancers rooted movement, quick footwork by bodies pushing down in resilient plies, for instance, in relatively circumscribed individual spaces. Lots of delay and echo, networks of it. White noise percussive sounds probably from Pugliese. Terrible, absolutely abysmal moaning/singing from Kosugi, probably the most unbearable of his vocal pieces on this set. At a point this echo-y percussive electronics goes away for a bit and electronics more akin to Tudor – more burbly, less fixed come in. Then there is a mix of the two, Pugliese and Tudor in their respective modes. Kosugi drops out now and again but always comes back with the horrific vocalizations. Really a disappointment for me, this and nearly all of the other Kosugi pieces where he does this. There is a bit later on where it sounds like the washes of electronics are trying to obliterate the voice. But also some bits of just effected voice which are particularly bad. Sculptures Musicales is a reference to a note that Marcel Duchamp included in the Green Box. where he refers to the Bride Stripped Bare By Her Bachelors, Even as a musical sculpture. Cage took that and create this text based score which calls for large amounts of silence. This realization is another welcome piece on this set and another one that one would appreciate a complete version. Various electronic sounds from drill like, to watery, to low ringing hums and so on interspersed with variable long silences. A great piece alas all too short here. There have been numerous other recordings of the piece of varying quality; I can recommend the version released on OgreOgress. 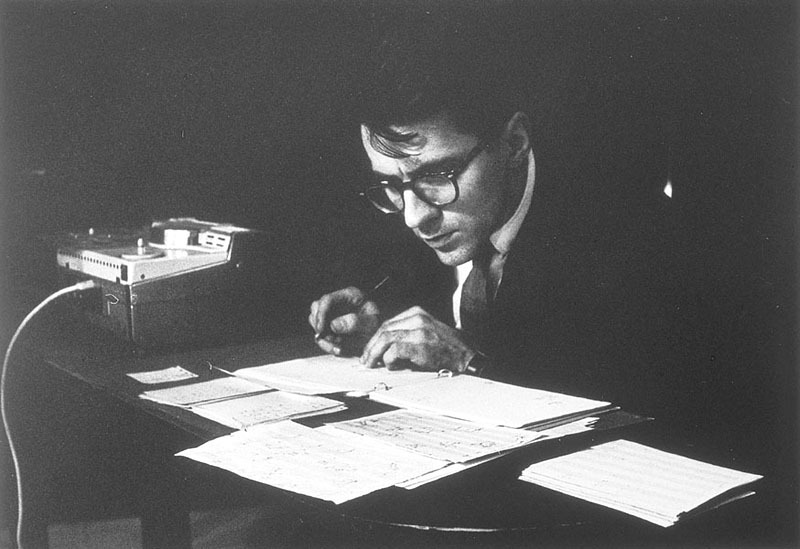 For anyone interested in the music of David Tudor this article is extremely interesting. Rogalsky was able to work with Tudor a bit toward the end of his life as well as being in charge of preparing many of his devices and such for archiving. He has thus had access to much of the essential material and the essential people. In this article he points out that Tudor and his acolytes were rather secretive about process and documentation and rather enjoyed cultivating an air of mystery. That combined with the fact that Tudor made, modified or subverted much of the electronics he used, not to mention that he was such a virtuoso perform makes recreating his pieces quite difficult. Virtual Focus it turns out was made as an art installation with Tudor’s frequent collaborator the sculpture Jackie Matisse-Monnier. The full table of electronics along with the corresponding mobile were left in near pristine condition in a pair of art collectors hands. It is “activated” by a dual cassette deck (Tudor often used pre-recorded material in conjunction with the live electronics as there are sounds that can’t be recreated on stage) which was missing the essential tapes. Rogalsky was able to check out this table, figure out how it works and then in the Tudor archives find a likely candidate for the cassette tapes for it. He then performed and recorded with it which makes up the much longer Virtual Focus piece on the Musicworks 73 CD. Do check out the (quite short) video link above of Matt Rogalsky recreating the piece, as you can see part of what makes it so unique (another short video, from what looks like an opening id here). The use of sonar and radar in this piece is what creates its characteristic popping, percussive sound. The music in this recording begins right off with squiggly high tones and a very low nearly subsonic scrunching in the background that occasional rises out. The oscillator towns become more ringing as it develops and the scrunching sound more defined less subsonic and begins to vacillate in the soundfield. Some really nice crackly bits come up occasionally, but the piece is mostly whispery filtered oscillator sound moved around the sounded along with that lower scrunchy sound. A great piece, one of the most interesting of the “new” Tudor pieces in this set, it is also one of the pieces of Tudors that I think shows how forward thinking he continued to be. His use of the radar, sonar and contact microphones is very similar to work that electronic improvisors would be doing a decade later. The tapes used in this piece apparently were recordings of contact microphones on kite strings – not too far from the contact mics on fences and wires that we’d hear from Alan Lamb and Jeph Jerman in the next two decades. One can easily imagine this already fairly spare piece (especially for Tudor), becoming increasingly more spare – Tudor after all did perform Cage pieces with quite long silences — and with its focus on more limited material we’d have much of the bases covered for the live electronics of the last decade. Wandering Satie like piano and then very slow rainsticks. Good use of space in this piece, it sometimes becomes completely silent, but much of the time it is simply at very low density with just a few grains of sand rustling through the rainstick. The second piano seems much further away in space and places even sparser. Occasionally as the piece goes on there are denser rainstick sections though never full on new age levels. When the oscillator comes in it is very Sachiko M – not super high volume, not too super high pitched and with very deliberate rainsticks has a sound that wouldn’t be out of place in say a Sachiko/Meehan collaboration. This excerpt concludes with what sounds like a quote of Satie’s Vexations (and is it turns out). The Neural Network pieces deserve their own post, especially considering my own study of neural networks, and their relationship to my own Network Instrument theory. Perhaps someday I’ll do so, but for now this is another welcome entry in the avalable recordings of this piece, espeically as the Neural Network Plus variant has not had a specific release. 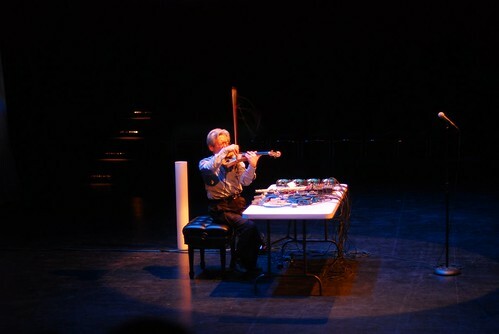 These two pieces which both utilized the Neural Network Synthesizer and were both based off the same “score” differed in that Neural Network Plus was a duo piece with Takeshisa Kosugi joining in on Live Electronics. The documentation points toward the complexity and inherent instability of the Neural Network Synthesis which perhaps was unwieldy in live performance and having another pair of hands to work on the surrounding electronics was a necessity. The sound of the duo is not too far from the available Neural Synthesis recordings though this particular instance is a fairly different animal from those released on Lovely and Ear-Rational beyond just the solo versus duo performance. Similar to Phonemes, Tudor chose to have recordings of the piece be fairly heavily manipulated in order to attempt to capture fundamental aspects of its live performance which utilized 16 channels. This recording however is simply a stereo recording of a specific performance of the piece and thus presents a more unaltered, if necessarily inaccurate picture of the piece. Along with the typical squeaking and feedback oscillators of the Neural Network Synthesizer there are big roars in this piece that could be from the tape. Juddering tones, metallic skronks and chittering feedback along with static crunches and grinding bleats all arise during the course of the piece. It is really nice to have this, a good compliment to the other Neural Network Synthesizer recordings and a really welcome part of this set.. This recording from 1994 has to be among the final Tudor performances and is a strong one. Disc Eight is decidedly mixed, with its rather banal John King piece (though it has some good playing from Tudor in it), classic drone pieces from Stuart Dempster and Takehisa Kosugi, a pretty terrible realization of an otherwise great Cage number piece and finishing off with the final Wolff piece of the set. Nothing holds this disc together at all barring the continuity of the performers and of course Cunningham continuing to work with them. This disc concludes the nearly constant presence of David Tudor as performer of music for the company as well as his short tenure as music director. Appropriately enough the solo Kosugi piece from 1997 would mark the beginning of his taking on of this role. Metallic and delayed sounds from the dobro run through the electronics and Tudors sounds coming in and out. A little over reliance on delay but some good popping percussive sounds from Tudor. Becomes really fast, with high velocity smeared out sounds whipping across the stereo space. Overall this piece doesn’t do much for me and I can’t find much else to say about it. Overapping overtones from hose, and multiple conchs. Great great piece, one of the all time drone classics. 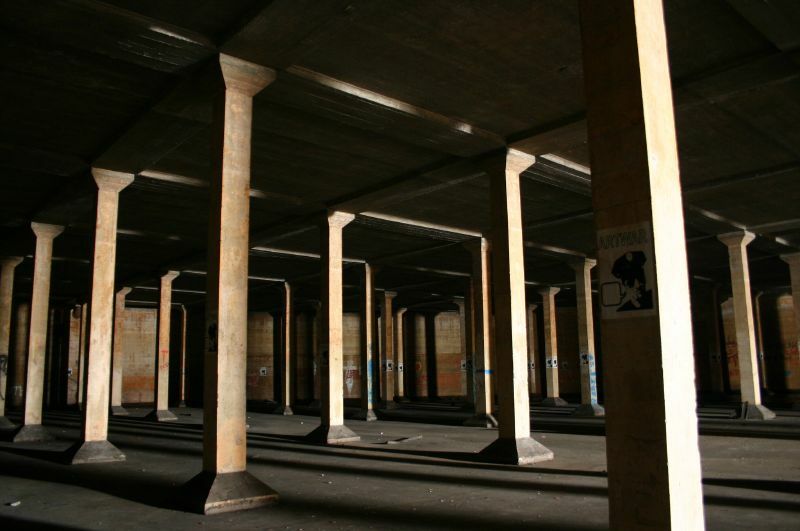 Well worth hearing the full version on Stuart Dempster’s Underground Overlays from the Cistern Chapel (New Albion). Drone music is deceptively easy to make, that is to say one can make passable drone music with very little effort. But it never has an depth and one tires of it quickly. To really make lasting drone music you have to connect with some essential slow movement at the heart of things, to capture something about the very essence of being alive: long slow rhythms such as waves rolling in, pulses whose timings may be the changing of the seasons – deep connections that we inherently connect to. This piece is one of those that makes those connections and endures. The Cistern Chapel itself is an interesting footnote: “The reverberation length is so long (approximately 45 seconds) inside the 186-foot diameter cistern at Fort Worden, about 70 miles northwest of Seattle, that the composer describes the feeling as “this is where you have been forever and will always be forever”.” (from “Blue” Gene Tyranny’s allmusic review). A challenging space to work in and one that demands you work within it’s limits, this piece demonstrates the rewards of doing so. Four6 is rather frequently recorded (especially by improvisers) as it doesn’t specifiy pitches in it’s time brackets, simply when sounds of the performers choice are meant to be sounded. As is often the case when this choice is presented to the performers you get results dependent on the sensitivities and seriousness of the performers. Cunningham continued to push ahead on the forefront of music utilizing such musicians as Jim O’Rourke, who has to be one of the earliest laptop performers. While O’Rourke may have been ahead of his time, no one has particularly accused him of being a particularly sensitive musician – very little of his music holds up in the long run, though he undeniably broke new ground for years. This particular instance of this piece begins with kosugi knocking rocks together in a rather metrical fashion, joined by long lines from Dempsters trombone and at times rather cheesy laptoperry from O’Rourke and DeMarinis. While this is rather early for laptop performance which you definitely have to give DeMarinis and O’Rourke credit for, the sounds just don’t hold up as well as the live electronics. Something about the digitally generated sounds, low bit depth samples or whatever but Kosugi’s live electronics stands in distinct contrast and are pretty great here. As usual though vocalizations are another story once he begins rather terrible cawing sounds Overlall I can’t say I particularly dig this version of Four6 though there are some nice parts here and there. Much more in Catch-Wave territory with the violin looped rather Frippertronics style. This is the kind of Kosugi piece I appreciate and am glad to hear here. This particular piece has some real low end tone generated from the layers of loop violin as well as some rather swoopy accelerated rising tones as well as some rather lyrical violin improvisations over the loops. These pieces from Kosugi, like the earlier Dempster piece, seem to tap into a slow pattern, such as blood flowing through our veins that I think connects to us in a fundamental way. Or Four People is a direct reference to Wolff’s earlier For 1,2 or 3 People : “This new work used some of the same graphic notation of the original piece, and was meant to be played by one to four performers using a variety of sound sources, possibly including, according to the composer, violin (or other stringed instrument), trombone, electronics, and keyboards.” (1) Tiny sound events, quiet and very spare. short sounds from the Violin, cello in the beginning then longer tones from the laptop and cello. Piano, quiet and in the background with that percussive aspect of preparations. While there are a moments of more intensify actives and the occasional louder bit it most has a rather introspective feel to it. Very typical of a Wolff piece in that it feels greater then the sum of its parts and seems to defy easy analysis. A new piece for me and one I’m happy to have heard. Even the more dated sounded digital squeals from O’Rourke’s laptop meld into the whole well enough. While the historical record of the pieces performed in accompaniment to Merce Cunningham’s dances is of interest in and of itself the real treasure of this set is its cornucopia of unreleased David Tudor pieces. Tudor’s live electronics was always ahead of its time and interest in it has never been higher than it is now. There is a resurgence of sorts in live electronics right now that takes the form in myriad of directions from ultra-minamalistic to ultra-maximalist and everywhere in between. But the core techniques and ideas are almost always to be found in the live electronics of Tudor and some of the others of the time such as Cage, Mumma, Behrman and so on. Use of contact mics (Cage’s Cartridge Music), electronically modified acoustic instruments (Tudor’s realization of Cage Variations II, Tudors Bandoneon !, Mumma’s Mesa), mixture of text and electronics (Cage’s Indeterminacy, Cage and Tudor’s simultaneous performances such as Mureau/Rainforest), exploration of room resonance (Tudor’s Microphone, various Lucier pieces), event activated electronics (Cage’s Variations V, Mumma’s Telepos) and so on. These notions and others have been minutely explored, iterated upon, taken to new places, combined in myriad of ways and fused with other forms to a degree that they can sometimes completely obscure these sources, but the ideas can be traced to this work. Tudor performed with the Cunningham Dance company from its inception in the early 50s, until his death in the 90s and during this time composed numerous pieces and was the companies music director after John Cage’s death in 1992. While a decent selection of Tudor’s pieces has been released there remains more pieces unreleased than currently available. Considering that these pieces were performed numerous times for dances and that due to the inherent unpredictability of live electronics each performance had its unique characteristics there is a vast archive of this material available. This set includes welcome new performances of several previously released Tudor compositions (Toneburst, Phonemes) but most valuably it contains four pieces that have heretofore not been released (Weatherings, Sextet for Seven, Neural Network Plus and the collaborative piece with Cage and Mumma 52/3) and longer excerpts from two pieces that have had very short excerpts released (7″ of Webwork appear on A Chance Operation and about 3″ of Virtual Focus on Musicworks 73). These are mostly presented in excerpts, which considering their unreleased nature is a real shame, but as the dances were often fairly long at this point it would be a box set in an of itself to release these pieces complete (which frankly there should be. As I said interest in Tudor’s work is at an all time high and I think such a set would be immensely valuable as well as presenting great music). The bulk of these pieces are presented over the next three discs and while the other pieces interspersed with them are mostly duds this makes for a pretty incredible run of music. The music commissioned by the Cunnignham Dance Company by the end of the sixties until Merce Cunningham’s death in 2009 has primarily been electronic music. As I have stated earlier this was often to the displeasure of the dancers and the audience in the early days. 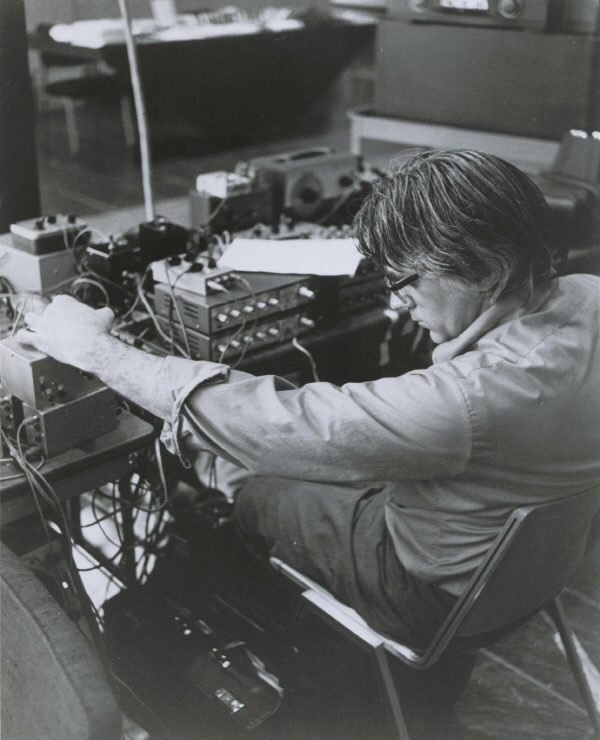 It is interesting, especially considering that John Cage, then musical director, while instrumental in the introduction and development of electronics had, by the late 70s, primarily moved moved away from them. This is, I think, further proof of Cunningham’s commitment to the new and experimental. 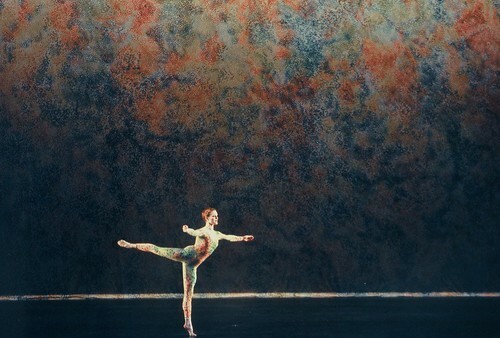 For again it was the composers he chose to work with that chose this direction; Cunningham would often provide only a time length and some vague description of what the dance is trying to achieve. Disc five is nearly all David Tudor pieces with a single piece by Yasunao Tone among three of his pieces. Two of these pieces have never been released and the other, Phonemes, is one of his major pieces presented in a different version then that previously issued. While the Tone piece isn’t very interesting in my opinion this is otherwise nearly a full David Tudor disc and one of the strongest, if not the strongest, in the set. The first real new David Tudor piece released in years and while perhaps not quite at the level of his best pieces, this is still a strong work. The piece begins with that trademarked percussive, chopped up feedback that Tudor was working with in the late 70s in pieces such as Toneburst and Untitled. Weatherings is a highly spatial piece, moving around the stereo sound field as if it might have whipped around the performance space. Made up of a jittering metallic sound and an swirling washing it has a strong feel of movement. A bit of an echoing phasing sound comes through as well. There seems to be several streams of sound and bits of it fade in and out with residue left echoing or squiggling in tight loops. It has a pretty wide dynamic range, with low density parts made up of just this aforementioned residue, whereas others are this huge roar whipping around the sound feled. If you have ever been in an intense windstorm that is the feel that the piece evokes: then whistling parts with the sound of trees swaying and a sense of waiting and then this freight train of approaching wind that on its arrival whips all around you. This piece more than most of Tudors belies its electronic nature and some of the sounds have a more clearly electronic nature as opposed to the otherworldly nature of a lot of the sounds he generates. It gets pretty intense at the end of this excerpt with streaming burbles of modified feedback and wallowing squiggles in the background. Another great piece and really nice to finally hear. This is the only piece from Fluxus artist Yasunao Tone included in this set. Personally I’ve always found the work from Tone, who is still actively making music today, to be highly mixed. At the very least his concerns seems to be pretty far from mine. However there are some gems among his pieces, but this one in my opinion is not one of them. Twangy qin played sedately as Cage reads the introductory text slowly ala Indeterminacy. Later Chinese texts are read in a similar manner and there is some piano along with the qin. Lots of laughter from the audience though so must have been a fairly amusing dance. While not a piece that does much for me, this is one of the few pieces that has been previously released. In this case it was released as a 3″ disc as part of a catalog for his first live performances in Japan after 28 years. The 50 page booklet includes an interview, criticism and biography all in japanese, but a list of compositions and discography are in English as well as Japanese. This version, which perhaps due to it having been limited to Japan (though you can get it from Mimaroglu Music Sales) is the exact same performance as that on this set. 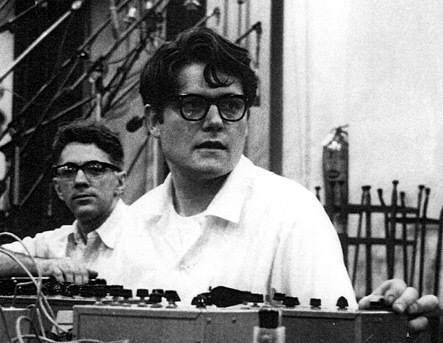 Another previously released Tudor piece (David Tudor Three Works for Live Electronics. (Lovely Music)) but in a different presentation. On that disc Tudor had multiple performances of the piece (possibly including this one) mixed together utilizing a specialized routing system so that it was almost a new piece composed out of Phonemes – a meta-Phonemes as it were. This demonstrates quite clearly that way that live electronics pieces are a composition in their construction in that the form of the piece remains the same even if the realizations are always unique. This is one of the strongest Tudor pieces and one that while it evokes speech as Tudor notes, it also has an alien aspect to it and is the kind of electronics that Tudor was almost alone in exploring. This performance of the piece begins with a rising rather guttural tone with a good space between it and the next guttural rising tone. The repeats for a while: rising tone, silence. After the third or fourth of these it becomes percussive with gated clipped staticy sounds. These become increasingly wet and burbly and while style percussive arhythmic. Other parts sound like distant garbled speech but the percussive nature is pervasive throughout the piece. It is interesting that this performance of the piece is from a decade after its composition. Again, not to belabor this point, this demonstrates the configuration is the score – if you can replicate the configuration you will end up with something akin to the original composition. This, as I’ve discussed somewhat in my Network Instrument posts, is something that is highly interesting to myself as a sort of physical realization of a type of graphic score. Another brand new Tudor piece and the most sedate of his live electronics pieces I’ve heard. It has a sound of distant metal flexing in the heat and and a background hum and develops into almost melodic tones. The background sounds become a bit more swirling and the metallic sounds a bit more insistent though less frequent. The faint melodic tones become a kind of tuneless whistling as if the wind occasionally picks up and blows through a hole in a piece of steel. Almost can hear distant sounds that Tudor’s Rainforest at times, with very subtle colorings in the far background. After about eight minutes of this it then suddenly assaults one with a much louder staccato electronics which quickly goes away and returns to the previous events. It comes back though. Again it falls away to the swirling background sound which is again punctured this time by what sounds like an electronic whale, whose plaintive and deranged calls continue on for some time while a seriously low end rumble shakes far below. The piece continues on this way with its low level but complex base into which these big dramatic aural assaults take place. In several places it fades away so completely as to leave almost no trace, but always events of some sort – dramatic and dense, or sedate and swirling, rise up from it. A great piece heard in its entirety here and really a highlight of the set. “WHEN does a quartet have five people? When it’s Merce Cunningham’s ”Quartet,” which was performed for the first time this season by the Merce Cunningham Dance Company last Wednesday night at the City Center. The unusual work for five proved to be both a working out of formal problems and an implicitly dramatic, though plotless, dance evoking isolation and loneliness. The dance for this piece is Quartet which is for five dancers and following that lead Tudor composed his Sextet for Seven. As noted by the Cunningham Dance Company the piece is made up of “six homogeneous voices and one wandering voice.” emulating the dance with its quartet of dancers and Merce’s interventions. Disc six in contrast to the nearly unified nature of disc five is one of the more mixed and varied of the set. It begins with probably the only Takehisa Kosugi piece that I can really get behind in the whole set. I feel I should pause a moment to clarify my disappointment in the Kosugi material on this set. This disappointment comes from being a long time fan of his work from Group Ongaku (recently reissued on LP! ), Taj Mahal Travellers, solo pieces such as Catch Wave and various and sundry collaborations and performances that I have heard. However it turns out that while I have enjoyed his violin and live electronics work I’m not at all a fan of his vocalizations and “singing”. He seems to utilize this rather unfortunate aspect of his performance more often than not and as there are a quite a few pieces and performances from him on this set (his being a member of the Company’s music crew since the late 70s and the musical director since Tudor’s death) it begins to seem like those other works were more the outlier. He also it turns out over-relies on delays, which while in his earliest work (especially with Taj Mahal Travellers) was rather innovative and charming, clearly became a crutch. I’d still consider myself a fan of his work as there are so many pieces of his that I love, but this set has definitely brought on a major reconsideration of his performance practice for me. The other pieces on disc six range from Tudor’s great Webwork, Cage’s strange Voiceless Essay, King’s rather uninspired electronic violin, to the banal new age-isms of Michael Pugliese’s Peace Talks. Rather 8-bit bleepy soundy, with a repeating pattern that speeds up after a bit. A whoozy also rather 8-bit whine oscillates in the background. Heavy use of delay and ping ponging between left and right channels (which could be indicative of a multichannel system recorded to stereo). While a bit cheesy this part which goes on for some time is not without its charms. As it progresses Kosugi begins to really overuse the delays and adding more and more sounds that are still pretty simple in and of themselves. More synthy type sounds come in though still rather low bit sounding (early 80s synths perhaps). While a bit cheesy it’s definitely the best of the new Kosugi on this set primarily because he keeps his mouth shut! Immediately begins with scritchy rather mechanical grinding violin and then layers of what sounds like sped up tape of violin. The tape contain a wide variety of sounds from tapping on the body to an almost human moaning sound as well as tape effects that sound like slewing, phasing and ping ponging. Pretty busy overall and while not a bad piece per say it’s one that doesn’t do much for me. It rather reminds me John Gibson’s flute and electronics piece on disc four, in that it works with layers from an electronically treated classical instrument, but it displays no creative use of electronics or of modifying the instruments sound. These two don’t seem really committed to the electronics and are perhaps using them because its the thing to do when composing for the company. When you contrast this to something like Mesa, where the bandoneon is completely transformed yet retains its inherent nature in driving the piece these pieces really fall flat. As is probably clear to the reader of these pages I often have trouble with voclazations. This is an aspect of Cage’s composition and performance, that while I can enjoy at times I can not always get behind. I love readings such as Indeterminacy as much as the next person but the pieces that are just fragments of words, odd vocalizations and isolated sounds I sometimes have a real hard time with. I absolutely can’t deal with such pieces on headphones and do always make sure to give them a try on the stereo. This piece is right on the edge for me, it is really interesting as a process and the sounds at times – whisperings layered together on tape with the starts of words and such – but sometimes its almost nails on chalkboard to me. However I found that when played on the stereo at lower volume so the sibilients fade away a bit it’s pretty haunting. While it will probably never be a favorite, I can say I like the piece and find it intriguing and well worth hearing. Begins interestingly burbly, perhaps resonance from filters alternating with a sort of popping skittering sound. This is followed by a more bleating metallic section. This becomes very spare with an almost liquid kissing sound which evolves into a percussive bit with a wooden affect. For a live electronics piece this one has a much more organic sound then most, perhaps what Tudor was after in the beginning. White, hisses with short delays moving it more into more expected territory. Alas this excerpt really does seem to short to catch what this heretofore unreleased piece is all about. Its an interesting one though, different from much of Tudor’s other live electronics and intriguing. Interestingly enough in the 1990s Tudor’s music, while certainly a lot less chaotic than the 70s material but still pretty far out for dance music, doesn’t elicit complaints from reviewers who now spend a lot more time describing the choreography, the dancers, the costumes and sets. “Movement material is, of course, what ”August Pace” is really about. More than some other Cunningham pieces, it has the dancers striking up a clearly outlined position and then holding it. The emphasis is on the hold. Sitar, tabla, rainsticks and performed in India – I gotta say I find it all a bit campy. Even for 1989 it seems a bit new age, world music stereotyped. Really not much to say about this piece – not one I care for much and as I say, totally cheesy. Though theoretically available late December 2010 New World Records epic ten disc overview of music used to accompany the Merce Cunningham Dance Company wasn’t widely available until early January. Since getting my copy I have spent the last two months listening to little else though after two initial sequential complete play-throughs (once open air and once on headphone as is my wont) , I primarily played specific discs and certain tracks (the David Tudor pieces in particular). At over eleven hours of music covering over fifty years and dozens of composers and musicians it really is an impossible task to summarize the entire set. 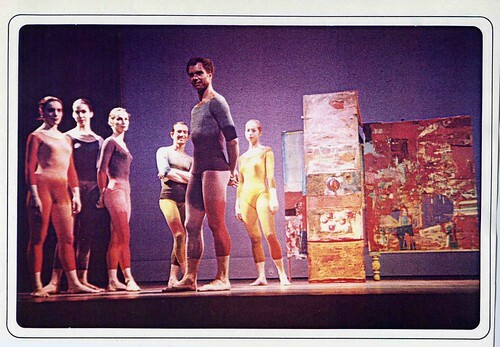 That is to say a “review” of the set would be rather meaningless as the connecting tissue here is Merce Cunningham and the musicians he chose to work with. It is these relationships and his championing of contemporary music that is the thread throughout the years as Cunningham pioneered in dance the notion that John Cage pioneered in composition: that a dance is defined by time.With this concept he was able to disconnect dance and music. Dance is often seen as interpreting music, often in a narrative fashion and while much modern dance seems to have eschewed the narrative aspects the notion of representing the music physically has remained a common fixture (I should state at this point that I am far from any sort of expert on modern dance and have really only come to it via the composers that Cunningham utilized. I’ve garnered a bit of a feel for its recent history, but am still woefully ignorant). By disconnecting the dance from the music the composers Cunningham chose to work with were able to address their own concerns and not necessarily (though some did) attempt to compose for a specific dance. Which is to say that a pure examination of the dance involved also are not necessary or sufficient either as a way of summarizing this set. The only valuable approach is to consider the individual pieces as themselves or as parts of the body of work of the individual composers. Complicating matters as a survey of the music utilized for the Company the set generally does not include pieces that are currently available or were unavailable for various reasons. This I think undercuts the impact of the set as a survey of the music used over the fifty years, though given the amount of music over such a long period of time perhaps any such comprehensive survey is impossible. The extensive liner notes do include biographicaly material and a selective discography from the primary composers but does not include a comprehensive list of all pieces utilized by the company nor much discussion of major pieces that were excluded for whatever reason. This is somewhat understandable as the liner notes are extensive enough just to talk about the included pieces (and many of these could use whole essays in and of themselves) but this kind of complete survey is something that I do hope is forthcoming in coming years. featuring perfomances by Christian Wolff, David Bindman, Fast Forward, George Lewis, John King, Jon Gibson, Matana Roberts, Shelley Burgon, Takehisa Kosugi, Gordon Mumma. While for me the specific attractions of this set is the wealth of unreleased David Tudor pieces, it is of course packed with other pieces I was highly looking forward to by John Cage, Christian Wolff, Morton Feldman, David Beherman, Takehisa Kosugi, Maryanne Amacher and so on. As I alluded to in the introduction it is somewhat of a grab bag on each two disc set and hard to think of them as complete albums in and of themselves. But that being said this initial set is easily the best in that regard. After a rarely heard tape piece from Christian Wolff the first disc is all piano pieces, all played by David Tudor (with John Cage on his Music for Piano). This lends to a continuity that makes this disc really work as few others do.The second disc in the set again begins with piano, Tudor and Cage again, playing the piano reduction of Feldman’s Ixion which is a real treat, but the rest of the disc charts of the very beginnings of use of Live Electronics in the pit of the Cunningham Dance Company. 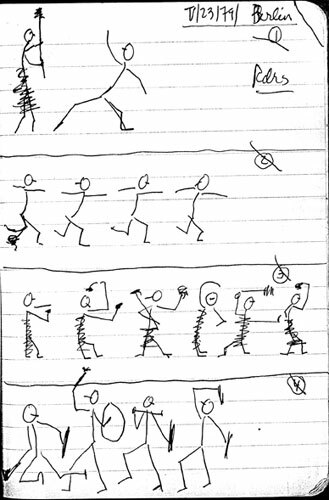 Merce Cunningham choreographed three solos (4, p.150) in the 50s for himself that all used Christian Wolff piano pieces beginning with this piece, one of Wolff’s earliest compositions.. This piece seems typical for his composition at this time when he was working with very limited material. It’s made up of small clusters of sounds fairly isolated with lots of silences in-between and featuring fairly wide dynamics. There is a faint sound of feet on wood in the background at times which adds this nice found sound aspect to it. The brief use of sustained chording later in the piece, contrasts really interestingly with the more almost staccato attacks of the bulk of the piece. Like so much of Wolff’s pieces it has this unexpected aspect to it; it never becomes predictable and always surprises you. Even with two pianists the music is quite spare, beginning with soft isolated notes, clearly separated between the two pianos. It varies a lot though with frantic little bursts at times, discordant little sequences, unexpected melancholy chords and short little almost melodies. This recording from 1954 with Cage and Tudor performing the piece in a slightly scratchy recording evokes the uncompromising nature of this music. Even as the Cunningham company began to achieve accolades for their dancing the music was routinely dismissed and jeered. That this piece, fraught with beauty and tension, garnered such criticism only goes to shows how different an era it is now. The low fidelity of the recording I think makes for an interesting addition to the piece as the decay of held notes seems to fade out into static and tape compression artifacts added a degree of mystery. A very welcome addition to the many fine recordings of this piece. The piece begins with several sharp attacks, spaced out. It has a kind of Webern feel which isn’t too surprising for early Brown, but a bit more spacious with just a hint of swing. You can hear the dancers footwork at times and the audience coughing. The piano keys are often forcefully depressed with a sharp attack, punctuating the more mechanical seeming sequences of notes. The work seems to open up as it develops and silences are introduced though it always retains this rather driving aspect. Brown wrote the orchestral version and then immediately a “literal piano reduction” for Tudor which is what we hear in this recording. The only piece on this disc I wasn’t previously familiar with. Again Webern-ish, with clusters of sounds of dramatically varying dynamics. A far denser piece than the earlier piano pieces but it does have its moments of spaciousness perhaps influenced by the New York School. During this period of time Earle Brown in particular worked and played all around Europe so one could see these ideas percolating through. Some brooding sections but always punctuated by short sharp attacks. It opens up more toward the end though always with varying attacks. Even with perhaps a bit of influence from the New York school it has a far more of the flavor the piano music coming out of Europe in the 50s. This is a great piece, one of the highlights of the set. It begins with one piano, high up in the register in this rather wandering, clockwork pattern of driving single notes. The second piano comes in and adds density and almost a contradictory line, feeling rather like modern improvisation where two musicians are playing separately but to the space. Then it becomes oddly disjointed and spare with either just one piano or the two trading parts. In contrast to late Feldman the notes are almost all pointillistic and not at all lush, there is a dry ascetic aspect to them which, as the piece becomes increasingly spare and soft, lends an alien feel to it. This is another highlight of the set, an important Cage piece only available on a VHS of the dance. This is a piece of live electronics where the dancers triggered the sounds via breaking light beams, radio interference and the light. It takes on overlapping rhythmic aspects perhaps reflecting the dance and also perhaps from the patterns that feedback can fall into. There is sound of radio interference, simple electronics, doppler effects and the like. A pity this one is in an excerpt though the whole piece is I believe about 50′. While the dancers may not have appreciated what was going on in these pieces and may not have always enjoyed the sounds their willingness to work within these circumstance and to rigorously perform their art is commendable. The music is highly interesting in my opinion and as it is directly related the choreography and movement of the dancers as well as the indeterminacy and inadequacies of the electronics setup the commitment of all involved was essential. This piece more than almost any other demands a DVD release. A swelling grinding sound that is the processed bandoneon. There are hints here and there of the soundworld of Tudor’s piece Bandoneon ! which this piece was among the inspirations. Much more dense than any of the preceding pieces, Mumma varies this density to give parts of it a more spacious feeling. Some really great sounds in this piece: bits on the edge of feedback, swelling sounds ranging from mechanical grinding sound, to wind through a narrow space to howls of electronic noise to this amazing bit that sounds like rattling ball bearings in an amplified sieve. In some of the soft sections you can hear the dancers movements. Some good loud noise about 2/3rds the way through and while there is a bit of characteristic primitive electronics it still sounds remarkable fresh and innovative. Ends with waves of tearing staticy feedback that is quite stunning. This has also been released on A Second Wind for Organ in a slightly longer 23 minute studio version. A fairly ponderous piece with its combination of electronics and traditional elements. It has a bit of the “sounds rushing in and out” of more stereotyped new music pieces of the day but interesting sounds from Tudor and Mumma. Cage, Goldstein, Neuhaus and Berhman on the traditional instruments is a pretty good pit. Electronics are a bit spacey and swoopy giving it a more cheesy flavor than the two previous more hard edged pieces. It seems to settle down though, become a bit more brooding and interesting, with often a thick sonic base in which piercing elements come in and out. There are sections of silence (only a few and not too long) and segments of just traditional instruments. As the piece goes on the ponderous feeling increases as a drum beats seem to slow the process down and the whole piece becomes somewhat unfocused. I like the last five minutes of the piece best, it becomes very spare, with an almost ritualistic feel, the electronics adding occasional and more interesting sounds, a melencholly tattoo from a single bass drum and then this oddly abrupt ending, A piece that was indeterminate in its instrumentation one supposes that it could be more or less successful depending on who or what is being played, this version at least seems somewhat mixed in its success but definitely well worth hearing. You can watch a short video segment of the dance as filmed for TV on YouTube. A Spiral Cage is powered by	WordPress 4.6.14 and delivered to you in 0.361 seconds using 24 queries.